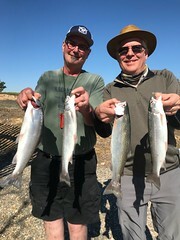 New client John and he brought along three of his friends for a day on the Sacramento river in hopes of catching some kings. The morning was cold and foggy and as we headed downstream it wasn’t long before we had our first fish of the day on and Shellaine grabbed the rod and the fight was on and after a short fight it was in the net. I headed back up stream and after setting the rods we were fishing again and the fog was getting worse, however I could still see the tress on both side of the river so we were oaky and then all of a sudden one of the back rods was hammered hard but before John could grab the rod the fish let go of the lure, we continued on and another 30 yards the portside rod went down and stayed down so Sean grabbed the rod and the fight was on and another salmon hit the deck of the boat. I was thinking this is great, however that’s would be it for the rest of the day. A great day with great people Thanks again!!!!!!!!! Returning clients Mike and Dan were onboard with me in hopes of catching a salmon. After getting a 20 minute late start do to the pay station malfunction Dan was finally able to pay. After launching I set four rods and we were on our way. Half way through the run with nothing Mike hollered fish on!! so I grabbed the rod for Dan and after a good short fight I was able to net the fish, we continued on for nothing, then we headed back up-stream and I set the rods back out and 50 yards in Mike again hollered FISH ON!! again I grabbed the rod and Mike was up and fighting the fish and after a good hard fight I was able to net the 15 pound hen. We tried for my fish for a while and we did have another fish on only to be lost almost at the boat. Great day with great guys. Thanks again!!!!! Returning clients Mark and his dad John came out to hunt down king salmon. The day was gonna be a windy one. When we launched the boat the wind wasn’t as bad as it was supposed to be, after setting the four rods we were on our way and not even a 100 yards in and the back rod went down very hard and Mark grabbed the rod and he began the fight, as John and I cleared the other rods and I grabbed the net, mark brought the big fish alongside the boat for me to net. After setting the rod back and another 100 yards the same rod started violently pulsing, I grabbed the rod and handed it off to John while Mark and I cleared the other rods John had a great fight on his hands and soon brought that big fish along side the boat for me to net. I removed two rods and continued for my fish for and hour for nothing and decided to call it good as the wind was really started to blow. A great day back with two great guys. Thanks guys!! 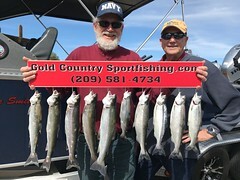 New Client Ralph booked a salmon trip with me along with two friends of his. The morning started off slow and right after a lure change the same rod was immediately struck and Ralph grabbed the rod and the fight was on and a nice 14 pound salmon was in the net, then about a 100 yards latter the same rod was hammered again but came up empty. After many lure changes along with other things that was it for the. Thanks again for coming out. New clients Jim brought along some of his family for a days trip on the river to hopefully catch a few king salmon. The four of them boarded the boat and we headed out. I explained what to expect and what to do when we had a fish on. I had the rods ready to go and when we arrived at our destination I set the first rod and as I was getting ready to drop the second rod I looked over at the first rod and it was violently pulsing up and down and so I shouted FISH ON! 11-year-old Carter would be the first one up, so as I slowed the boat the fight was on, the fish was getting the best of him, however Carter was bound and determined to win and after several minutes and good runs the fish took we were able to put the 14 pound king in the net… after a few high fives and photos I reset the rods and we continued on, another mile the back rod went down and Chris was able to grab and he reeled in a nice 11 pound king. That was it for sometime, then on one pass much later on the starboard side was slammed and Jim yelled FISH ON! as soon as Matt grabbed the rod and made a few turn son the reel the fish was gone UGH! the fishing was slow for us on this day, then on the last pass one of the back rods was getting hit very hard and as soon as I grabbed the rod the fish let go. That was it for the day. A nice day on the Sacramento river with great people. Thanks again everyone. Returning clients Mike and Charlie were onboard on October the 19th. The morning started off great with Charlie getting the first fish in about the first 100 yards, then soon after we a had another fish slam the rod. 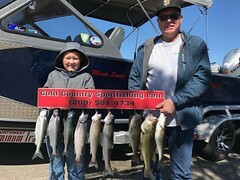 however it didn’t stick, I quickly got the rod back out and 25 yards another strike and this time Mike connected and soon we had a 14 pound hen in the cooler, so now its my turn and 1 mile later we had another fish on so I was able to land my fish, 9:30 and we were headed in. A great day with great guys!!!! !